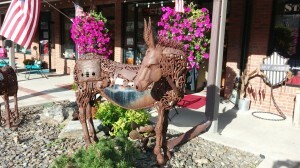 Hill City and the surrounding small towns around the South Black Hills have lots of art work decorating the streets. 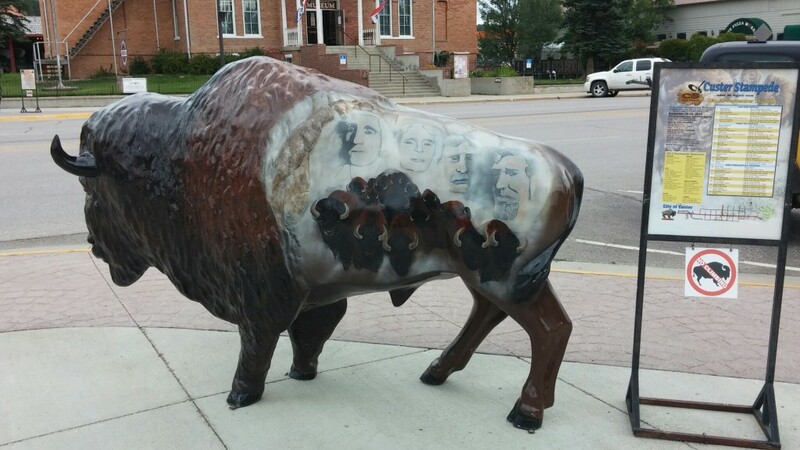 In Custer City, there are dozens of painted buffalo on display on their main street. 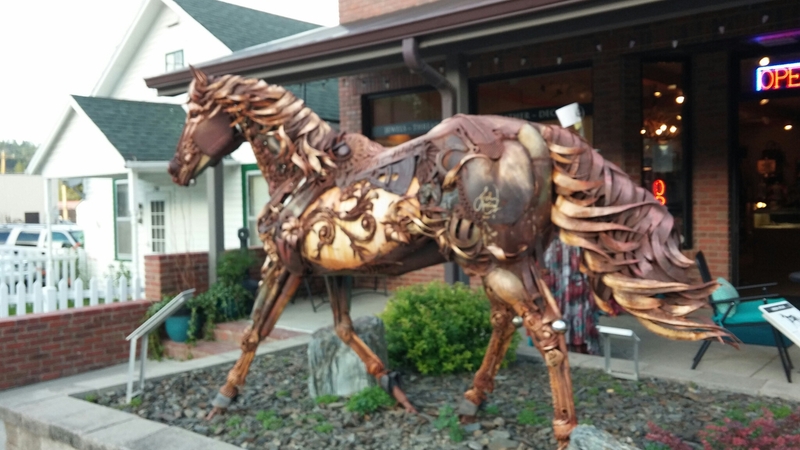 In Hill City, some of the shops have amazing animals built out of recycled tools and metal parts and scraps. 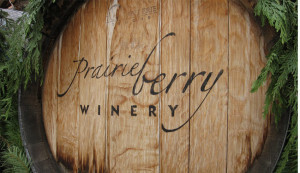 And there are enough wineries, distilleries, and breweries to meet everyone’s needs. 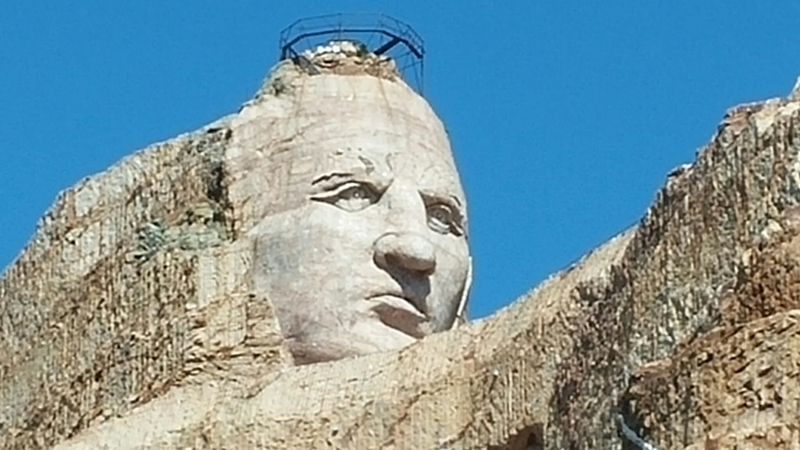 We visited the Crazy Horse Memorial yesterday. The sculpture has been under construction since 1948 and will be a massive 641 feet wide by 563 feet high when it is completed. Not only is it huge, it is three dimensional and will be sculpted on both sides. 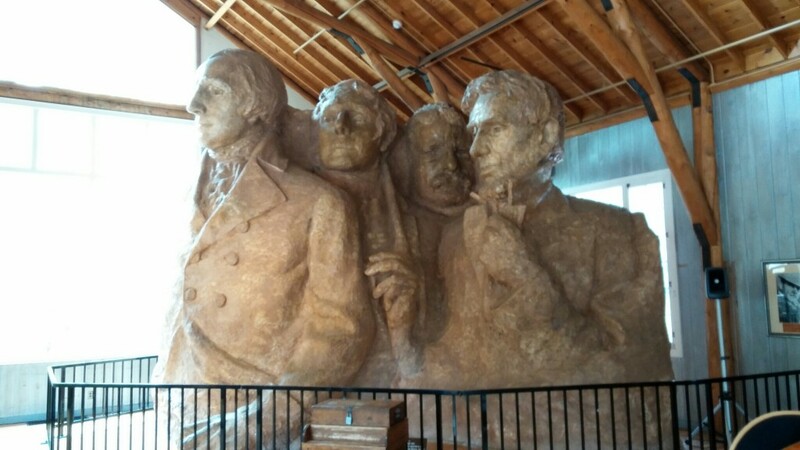 Ziolkowski was 40 years old when he started the sculpture. He made the decision that the undertaking would be not be government funded and started a private non-profit organization. 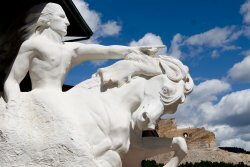 He had a vision that the sculpture would serve as a part of a combination of museum, cultural center, and Native American university. Ziolkowski and his second wife had ten children, and most of them work for the non-profit and live on the foundation’s land. 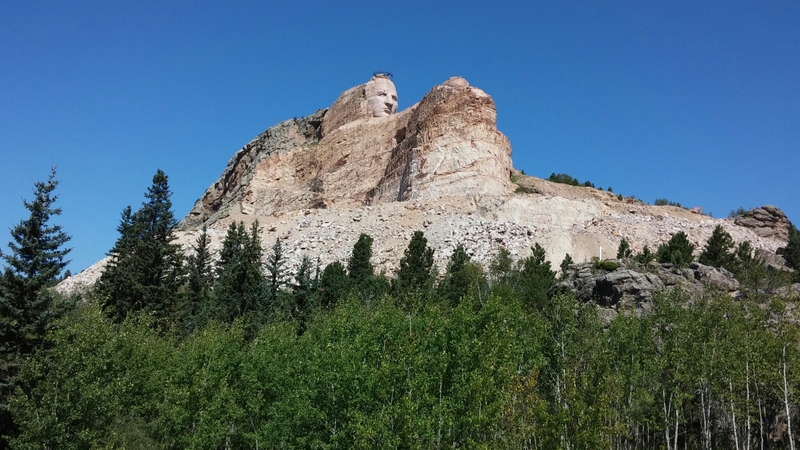 To get an idea of the sheer size of the piece, all four presidents’ heads from Rushmore would fit inside of the Crazy Horse sculpture’s head. 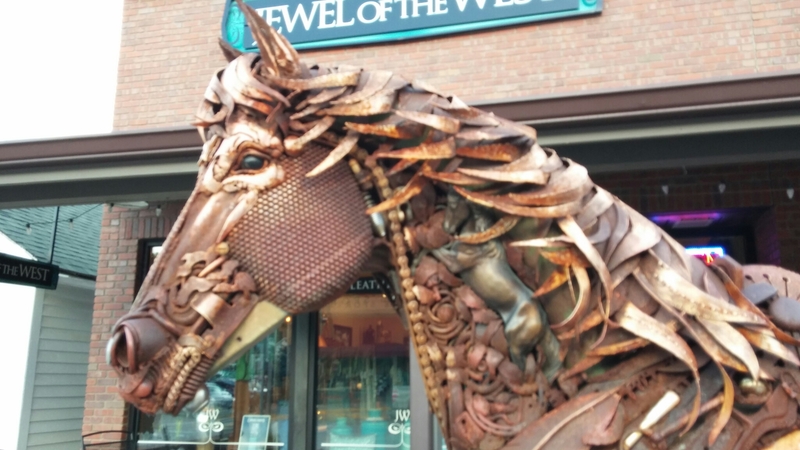 There is a lot of controversy about both the sculpture and the non-profit. 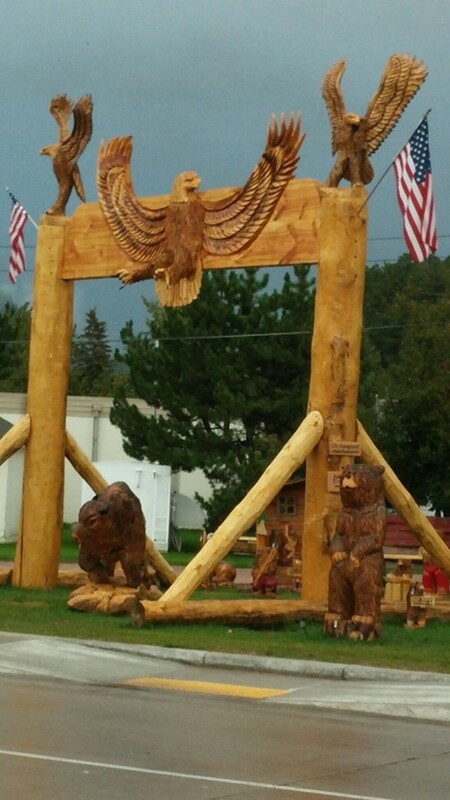 Some Native Americans disagree with not only the sculpture, but the placement of it on sacred land. 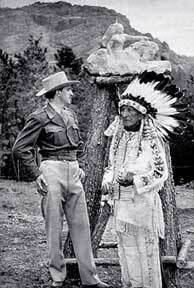 Descendants of Crazy Horse were not asked about the project before it was begun. Many object to the distribution of monies made from tourists visiting the site to find other projects besides the sculpture. 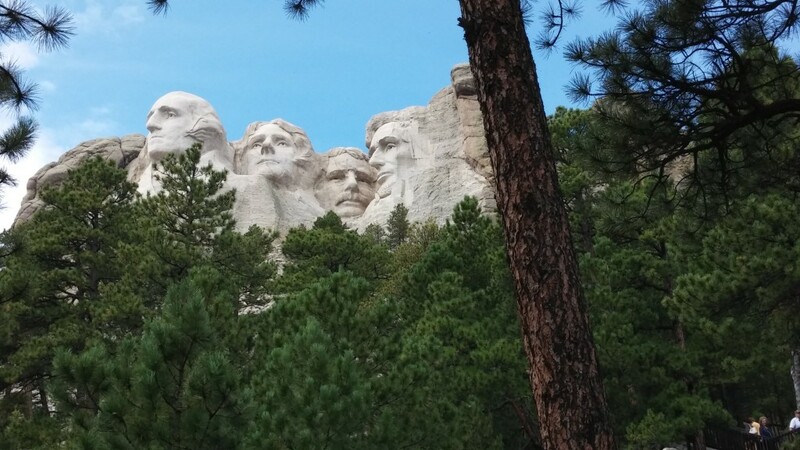 I wanted to come to South Dakota to see Mount Rushmore, but I fell in love with the Black Hills! Color me naive but I didn’t know the Black Hills were so named by Lakota Native Americans because the denseness of the trees make the hills look black. How does one describe four granite carvings that are over 60 feet tall commemorating the four most notable presidents from our country’s first 150 years? Pretty hard to do… I learned a few things today about the memorial. They cover approximately 50 miles by 100 miles. Harney Peak, at 7244 feet, is the highest peak not only of the Black Hills but of any mountain range east of the Continental Divide to the Swiss Alps. 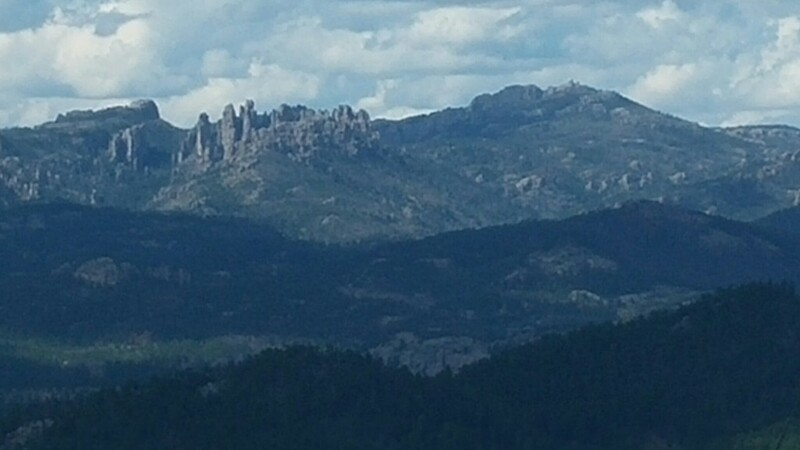 The beautiful Cathedral Spires are to the left of Harney Peak in the above picture. 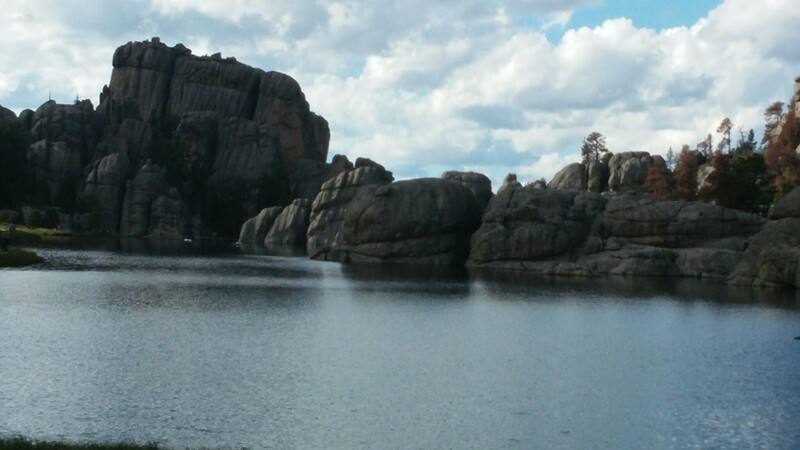 Sylvan Lake is close to the spires. It is one of the prettiest lakes I have seen. There was a wedding there when we drove by. What a wonderful place to start a new beginning! 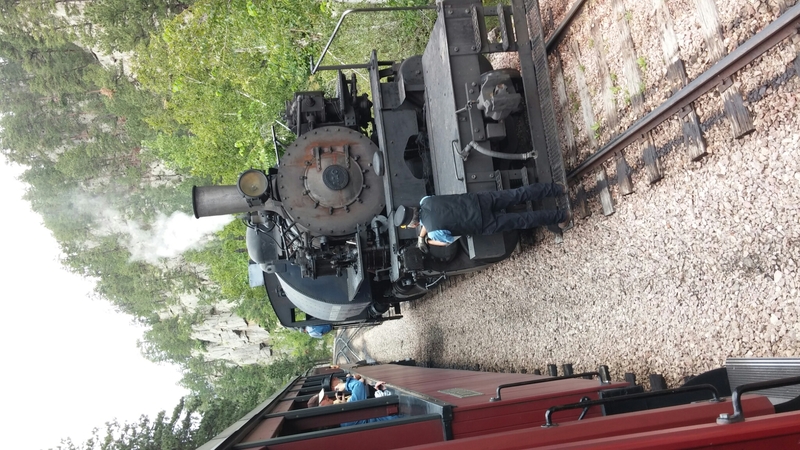 We rode the 1880 Black Hills Central Railroad Train today from Hill City to Keystone and back. It’s a beautiful train and a beautiful ride. We saw lots of deer, a badger, and clutch of wild turkeys. Apparently I didn’t look close enough at the baby turkeys because one of them is an albino! The train runs on used motor oil. 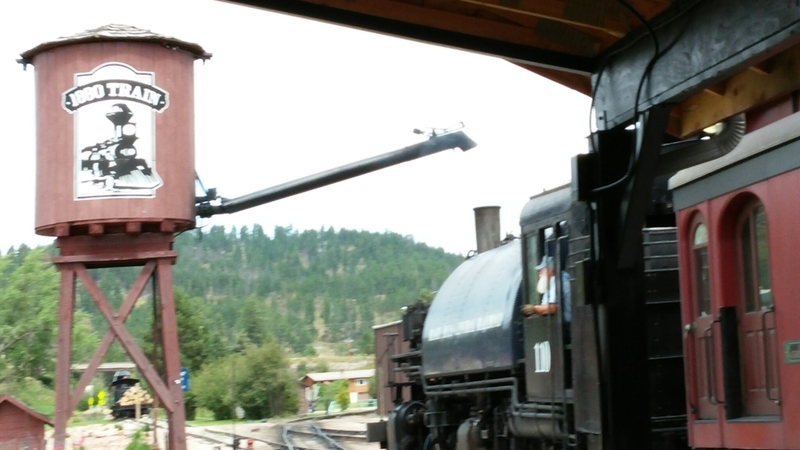 And periodically they shoot sand up the smoke stack when the train is running at full throttle. The sand cleans the creosote build up. 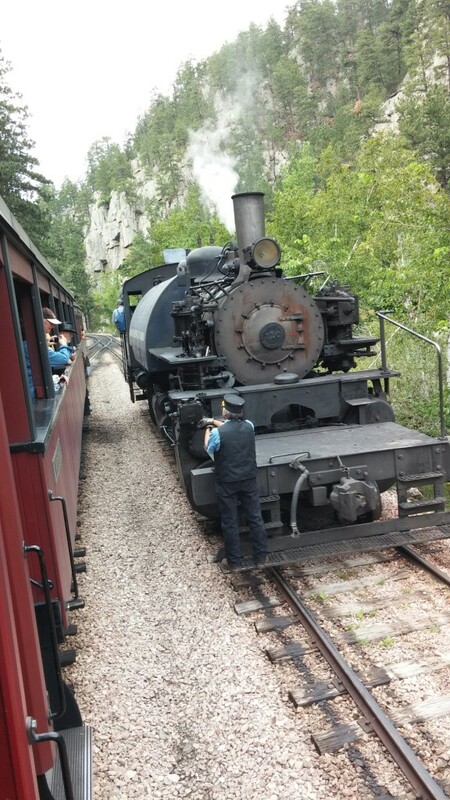 We passed over 20 streets and with each crossing the train’s whistle blew two longs, one short, and one long. That indicates to drivers and pedestrians that a train is neat and will be crossing soon. 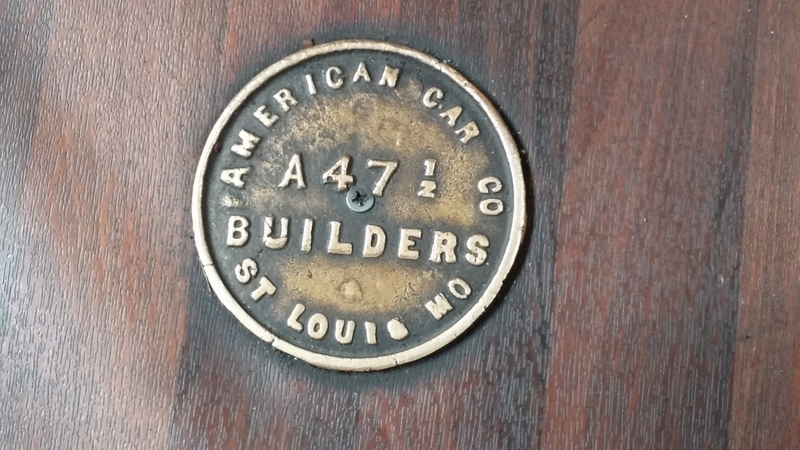 All of the cars in the train are refurbished originals. They are stunning. The seat backs flip so that riders can face either way because the cars don’t turn around at the end of the track. To celebrate our journey, Rich took his first selfie! During our drive from North to South Dakota yesterday, we drove through the middle of the United States, literally. The geographic center of the nation was determined to be in Lebanon, Kansas until Alaska and Hawaii were awarded statehood. 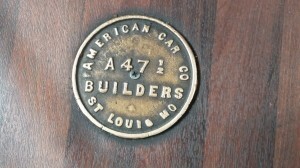 That shifted the center 440 miles to a private ranch 20 miles north of Belle Fourche, South Dakota. 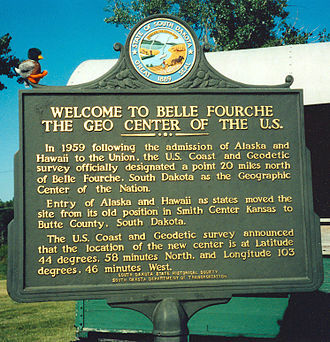 So Lebanon can claim to be the geographic center of the 48 contiguous states, and Belle Fourche of all 50 states. 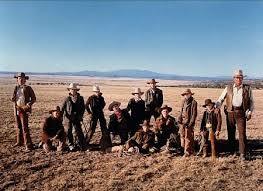 You can find it with the following search string: The Cowboys stuttering scene. Enjoy! I thought I’d take this opportunity to talk about a few of the people we’ve met along our journey so far. Rich met Margaret in Caldwell, Idaho, when we just got Homer, our motor home. She had a friend who had bought the same model and was having trouble with it and wanted to know if we were, too. Margaret is a widow in her late 70’s. She has been a full timer for over 15 years. 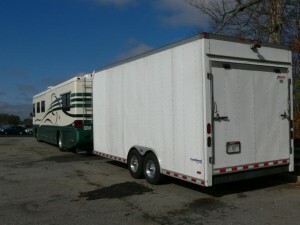 She and her husband had a 50 foot motor home and pulled a large enclosed trailer from Arizona to Alaska for many years. Margaret does it all–from hooking up the trailer when she moved to attaching all the septic, water, and electrical connections. Her friends and family want her to stop traveling and move into a house. She adamantly said she’ll never live in a house again. When she’s too old to drive her rig, she’ll hire a driver to move her to each new location. I met Judy in the laundromat of the park in Medora just last night. She and her husband are new to RVing. They bought their 26 foot pull trailer in April, and this is their maiden ‘long’ trip. They plan to visit seven national parks in six weeks covering over six thousand miles. They have a house in Tallahassee, Florida, and a vacation home in the mountains of North Carolina. She hopes to settle in the mountain home even though most of their family is in Florida. Judy and her husband are not traveling alone. They have two Golden Retrievers and two cats. 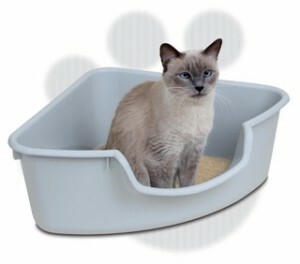 One of the cats is a Siamese who is 17 years old. As they drive down the road, their dogs are tethered in the back seat. The younger cat sleeps under the seat, and the Siamese wanders wherever he wants. Because he’s 17, she keeps a litter box on the floor at her feet so he can use it as needed. Jason lived two spaces away from us in Livingston, Montana. 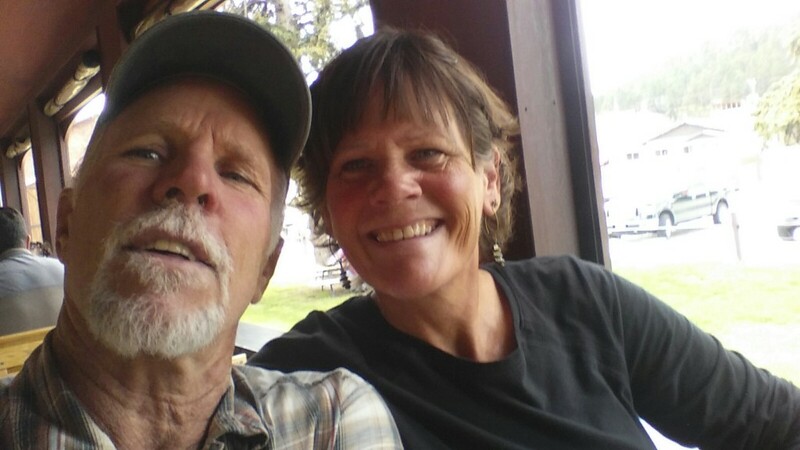 He bought a fifth wheel trailer, gave his horse to his aunt, loaded his barn cat into his pickup and drove up to try “the best flyfishing spot in America” on the Yellowstone River. He got his guide license, and he fishes morning, noon, and night. He’ll be moving to Cody, Wyoming, soon to start a job as a fishing guide. 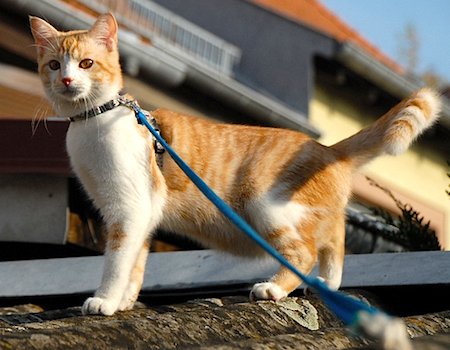 Jason’s cat is trained to stay in his park spot by being tethered on a leash. He will drag the leash just a bit, but then he will settle down and just lay on the grass sleeping in the sun. 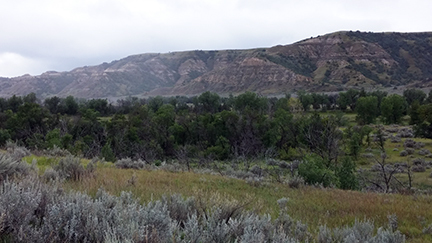 We drove just north of Medora to visit the Theodore Roosevelt National Park. 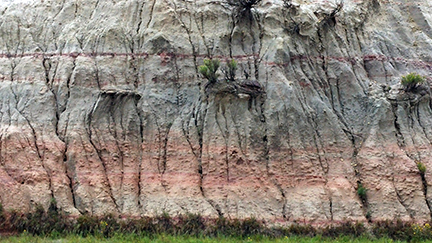 The park covers 110 square miles in the badlands of western North Dakota. 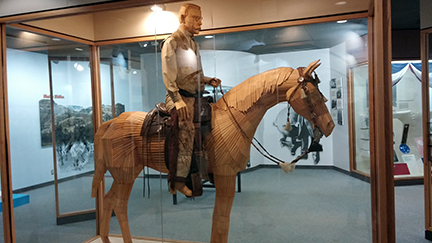 At the visitor center, we learned about Teddy Roosevelt’s life and how he came to North Dakota. 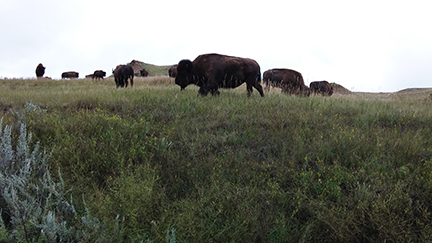 Roosevelt first came to the North Dakota badlands to hunt bison in September 1883. 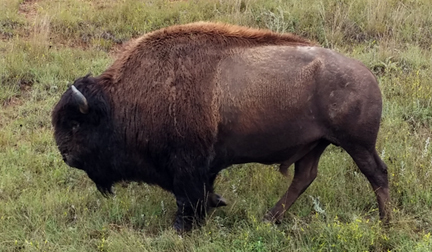 During that first short trip, he got his bison and fell in love with the rugged lifestyle and the “perfect freedom” of the West. 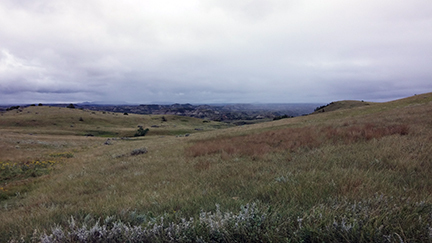 He invested a cattle ranch seven miles south of Medora. Following the death of both his wife (a few days after childbirth) and mother (from Typhoid) on February 14, 1884, Roosevelt returned to his North Dakota ranch seeking solitude and time to heal. His adventures in “the strenuous life” outdoors and the loss of his cattle in the starvation winter in 1886-1887 were influential in Theodore Roosevelt’s pursuit of conservation policies as President of the United States (1901–1909). 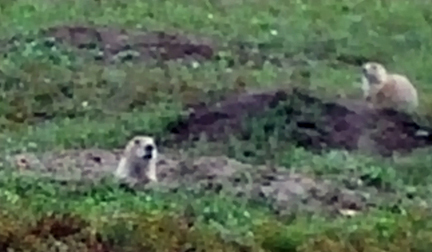 We drove along a 35 mile route around the southern section of the park and saw lots of wildlife. We watched hundreds of them squawking and talking to one another as they worked on their burrows. These are my favorite animals to see in the wild. One walked down the street without a care in the world. The others were grazing peacefully among friends. We also saw mule deer, a doe with twin fawns. They were camera shy so I didn’t get a picture. And we saw a couple of wild turkeys. I didn’t get a picture, but here’s one I ‘harvested’ off of the Internet. 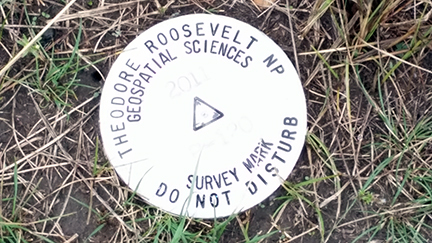 Sophie and I discovered this survey marker on the top of a small hill where the buffalo often roam (and poop). 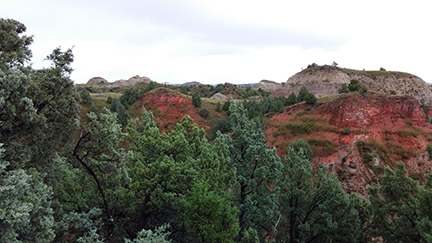 After driving a thankfully short distance in heavy rain from Glendive to Medora yesterday, we parked Homer into his new spot for the next three nights–the Red Trail Campground. 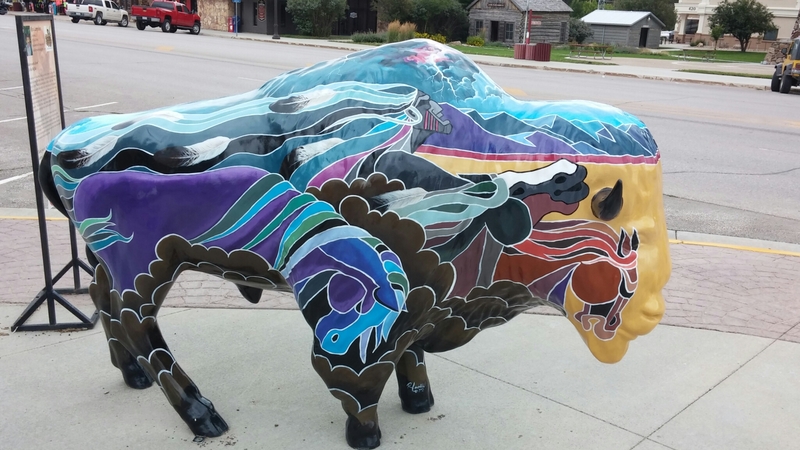 Medora is a quaint historic western town that targets tourists. Activities include a cowboy fondue where steak is cooked on a pitchfork and a Broadway musical that entertains 2000 people every night all summer long. Today was chore day–laundry and shopping. There’s no grocery store in Medora, so we drove to Dickenson and visited Walmart. This was actually more entertaining and informative than driving to Williston. It felt like the Bizarro World Seinfeld episode where everything is nearly the same but oddly different. The Walmart is very new and it looks like it was built in a hurry because there’s no rock work on the outside. Even though it was raining buckets, there were no rugs at the entrance. Here’s a press picture of the store in Williston when it opened last year, and it looks like a carbon copy of the Dickenson store. 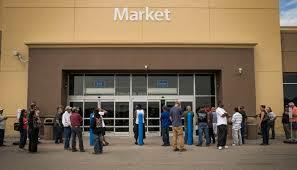 The changes from Idaho and Nevada Walmarts where I normally shop didn’t stop at the door. Three-quarters of the vehicles parked outside were pickups, most covered in mud and oversized for the parking spaces. 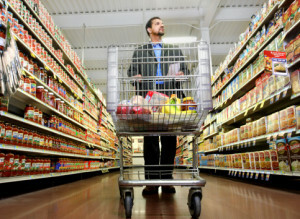 Three-quarters of the shoppers were male. I hate to be sexist, but most men look tortuously uncomfortable in grocery stores, and the ones we saw today were no exception. Men under 35 shopped in packs of at least four. Those over 35 shopped alone and actually used a basket or cart. The floor of the produce section was filthy. I watched one man grab a bag of lettuce. He examined it for about thirty seconds while the contents poured out on the floor from a hole in the back. Once he realized what was happening, he casually tossed the half empty bag back in the pile. Rich was looking for a part for his bicycle. When we ran into one another, his eyes were huge. 🙂 People were riding the bikes in the aisles and leaving them wherever they felt like it. He dodged bike riders down the entire aisle. Rich finally found someone who knew. 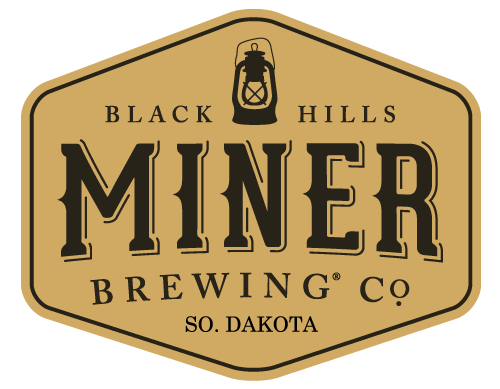 The beer and wine is sold separately in a small, self-enclosed room that has its own entrance at the front of the store. When he went to buy some, the room only had one other customer. His purchase was bagged in a brown paper bag set inside a Walmart bag by a woman he said looked like she’d been tasting the inventory. A few years ago I listened to two early 30-something sportscasters debate the ‘perfect’ morning cereal. 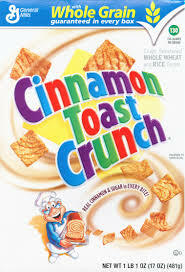 After taking calls from their listeners (in the same age and sociodemographic group as them), the hand down favorite was Cinnamon Toast Crunch. As I looked for my bran cereal in the cereal aisle, I laughed outloud. The Cinnamon Toast Crunch section was empty except for two boxes on the bottom shelf. 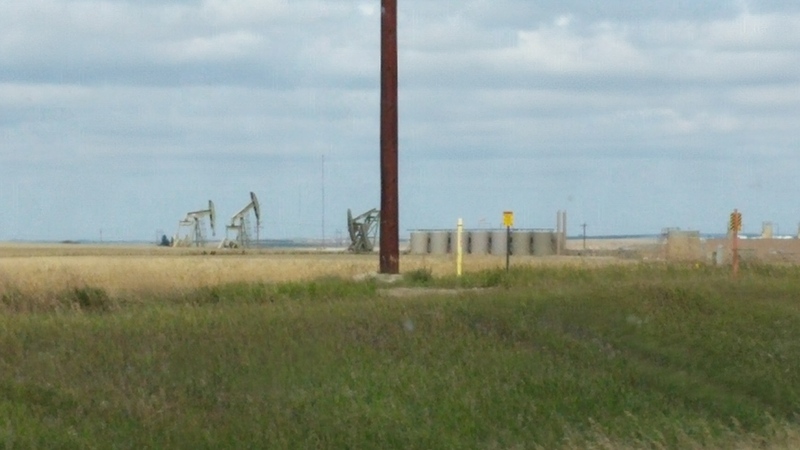 We drove to Williston, North Dakota, yesterday to take a look at all the oil drilling taking place there. In ten years the size of the town has more than doubled from 12,000 to well over 30,000. Changes in how oil is drilled (using a process called fracking) combined with the increase in oil prices set the scene for this boom. We drove through amazing agricultural farms, and as we got closer to Williston we saw more and more oil rigs pumping away. Rather surreal to see the drills set up in the middle of corn and wheat fields. 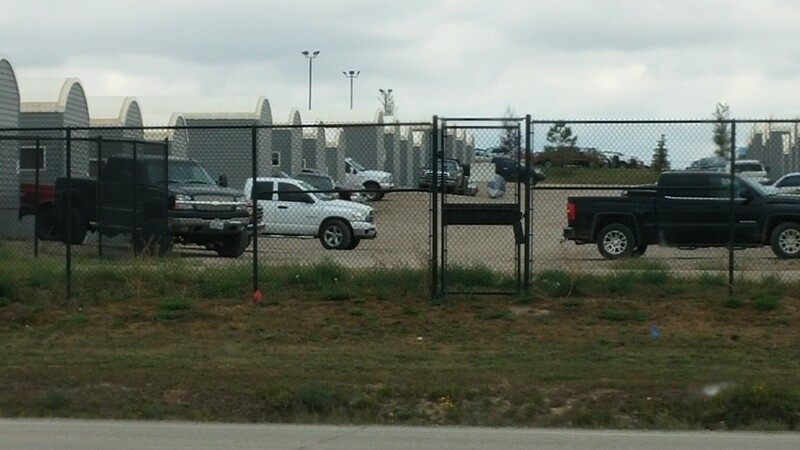 On several ranches we saw lines of travel trailers, each with pickups and Suburbans. Once in Williston we saw cluster after cluster of “man camps”. Many of the larger contractors provide housing for their employees. As we drove through town, at least 3/4 of the vehicles were trucks–both semis and pickups. The pickups are covered in mud, but there must be rules about identifying company trucks because the front doors are wiped clean so you can see the company logo. 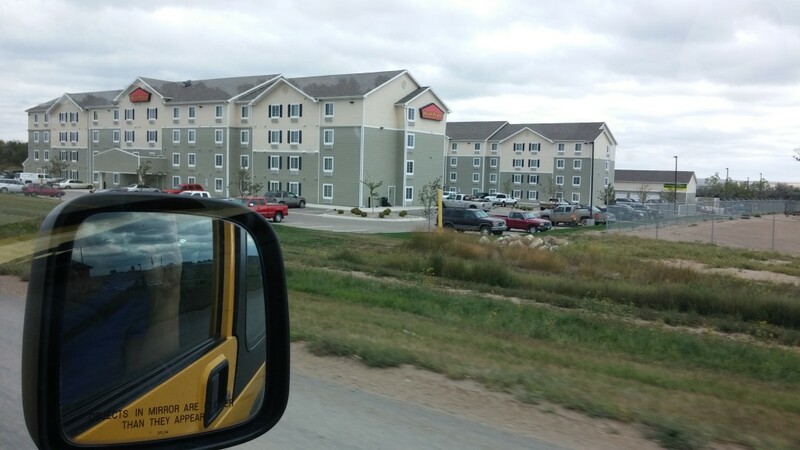 There are dozens of extended stay hotels, and most offer both accommodations and storage where you can store your stuff when you go home every third week. It’s hard to find places to stay. At a town about 30 miles away, a private home was offering a room for $80 per night. One of the extended stay hotels charges $599 per week for a double bed, and $799 for two double beds. All of the restaurants in town were very busy. And there are many help wanted signs and billboards around the area. Many businesses close down because they can’t compete with the high wages offered. I checked for jobs in Williston on monster and it listed over 800 jobs. Towns around the area are struggling to get and keep employees. I saw a large sign at the K Mart in Glendive advertising for employees at $10 an hour to start with no previous employment necessary. One of Williston’ s most famous native sons is Phil Jackson who coached the Chicago Bulls and Los Angeles Lakers to many championships. 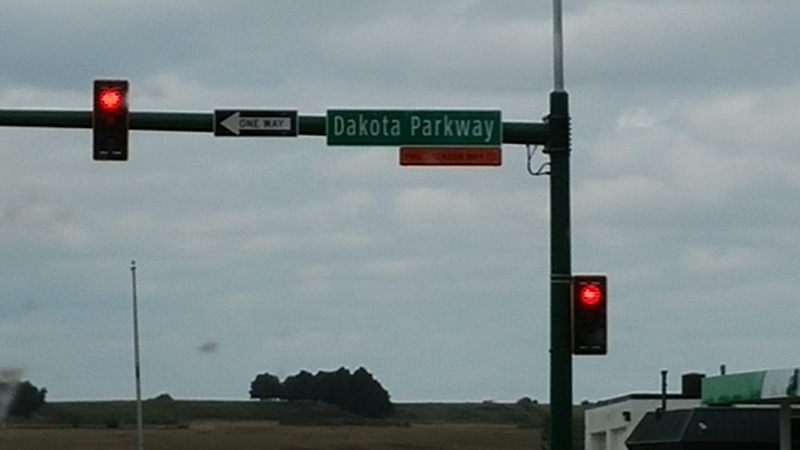 They’ve named the main street after him. (Might be hard to see… It says Phil Jackson Way and is followed by a basketball.) The area infrastructure is struggling to keep up. 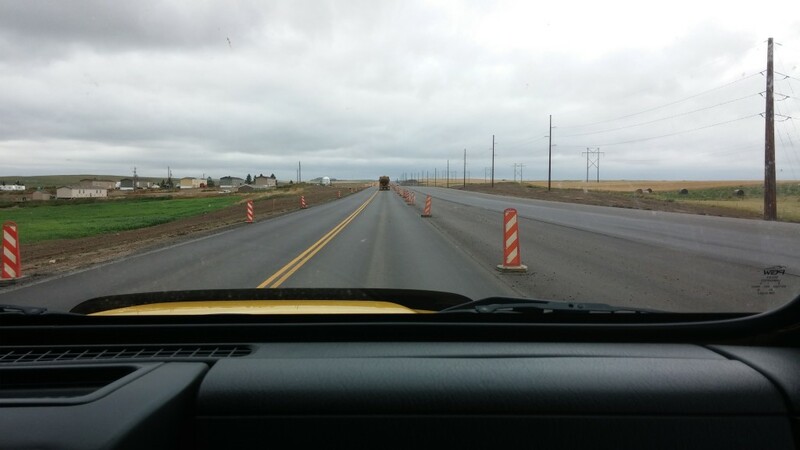 Two lane country highways are being expanded to four lane freeways. If I was younger and had no kids, I would try to get a job up there. Starting salaries are reportedly $100,000, and to work there a few years to build a nest egg would be worth it. One of the great things about traveling so much is finding out something REALLY unique about a place. 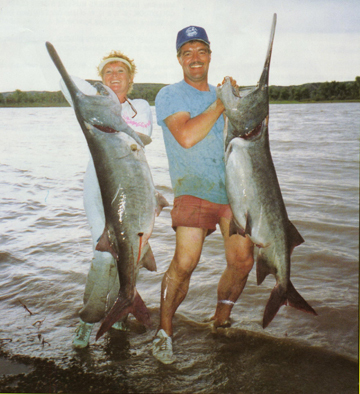 It happens a lot, but Glendive’s 45 day paddlefish season takes the top prize on our trip so far. Each year 4000 fisherman descend to Glendive in mid-May. From there they make a 15 mile trip north on the Yellowstone River to Intake Diversion Dam to fish for paddlefish. Anglers snag the prehistoric looking fish because the fish won’t take bait–they are filter feeders. A 142 pound fish caught in 1973 holds the record. Most range from 70 to 90 pounds. In order to prevent over fishing, the state limits the count of fish caught to 1000. 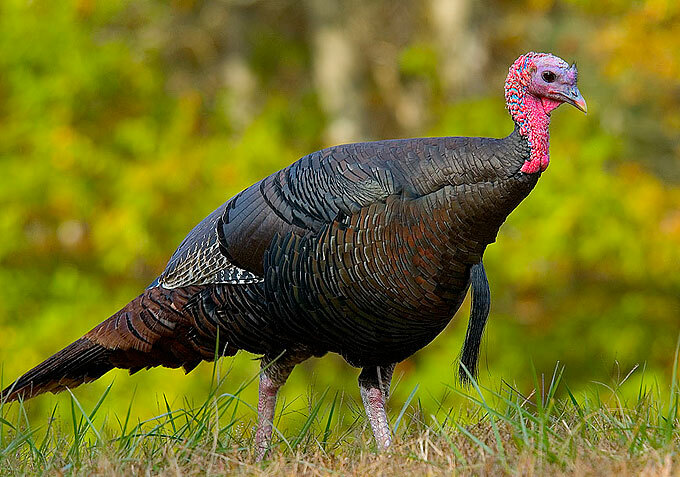 The 2013 season lasted ten days because the limit was caught that quickly. The Glendive Chamber of Commerce collects the roe (eggs) from the fishermen who donate it after volunteers clean the fish for them. 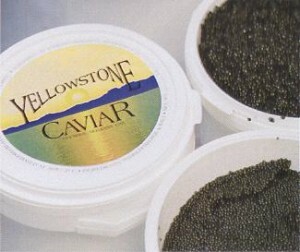 Workers process the roe into Yellowstone Caviar which is sold commercially. Thirty percent of the net proceeds fund paddlefish research. 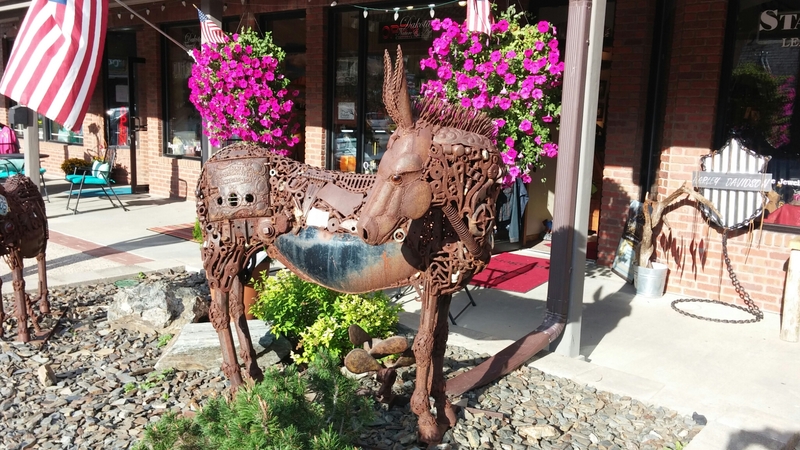 The rest funds historical, cultural, and recreational projects in Eastern Montana. Almost a million dollars had been raised in 20 years to fund over 450 grants.